My Health: What’s Climate Got To Do With It? Reducing Health Disparities through Sustaining and Strengthening Healthy Communities. 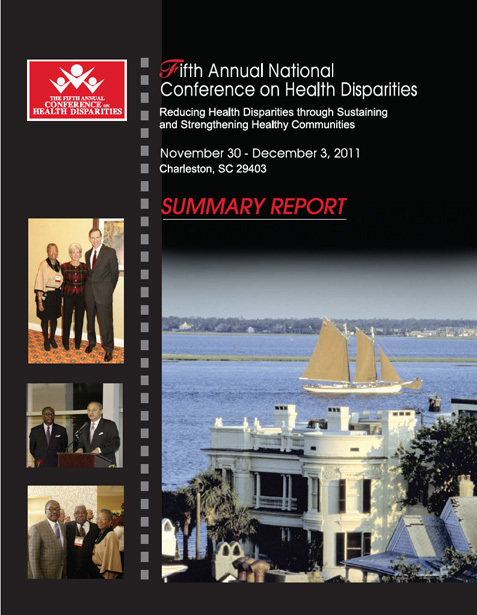 The Fifth Annual National Conference on Health Disparities will take place November 30-December 3, 2011, in Charleston, SC. Its mission: to focus on policies and programs that address prevention, social determinants and personal responsibility to reduce health disparities. This conference will continue to address the question: How do we augment our nation’s current “sick-care” medical model with a comprehensive “well-care” approach that sustains and strengthens communities by fostering genuine progress in reducing health disparities? From 2007 through 2010, national conferences in Charleston, SC; St. Croix, U.S. Virgin Islands; Atlanta, GA, and Philadelphia, PA, brought together diverse partners, presenters and attendees to share their knowledge of health disparities. These programs uncovered a larger story: that social determinants, such as poverty, low education levels, public safety, environmental quality and inadequate housing, are major contributing factors to health disparities. So, too, is personal responsibility – each person’s willingness and ability to make informed decisions about lifestyle choices to reduce the likelihood of disease development. These findings suggest the potential benefits of dedicating more of our nation’s healthcare resources to programs that emphasize education, prevention and personal responsibility. Participants in the upcoming conference will discuss ways to incorporate these understandings into policies and programs that target health disparities. These may include education and prevention programs, community outreach efforts, improved access to care, environmental quality and public safety initiatives, and policies that recognize and address the impact of social determinants and personal responsibility on human health.